Woof, this Summer has been crazy for sad and happy reasons. I found myself in a Dog Rescue then fostered by a nice human family with 7 rescue cats who are going to adopt me! My humans have been taking myself and their small humans (plus sometimes Granny-human in tow) to dog friendly places (Granny-Human only seems to tag along when there is cake involved). We went to Fron Goch Garden Centre too and humans had tea, I saw they sell dog biscuits near the ice cream counter but no small dog treats (lucky that I take my essentials of Pero treat biscuits and poo bags everywhere with me). Humans have joined the ‘ Pentref Taclus – Llanberis – Tidy Village’ litterpicking group, where I was made mascot of the week (nearly lost the title it to a plastic bottle collecting dog). It’s a very dog and child friendly group of humans who get together every Sunday morning to go and collect litter around the village. I was at the first litter pick and since then they’ve collected over 100 bags of rubbish…Humans are very messy creatures. After one of the litter picks we went to Pete’s Eats and sat outside and had a few of my Pero biscuits. On the next table where 3 French Bull Dogs all dribbling at the sight of the Pero treat tub, so Human offered a few biscuits. Their human declined by saying ‘ Sorry we only feed our dogs grain free products’. 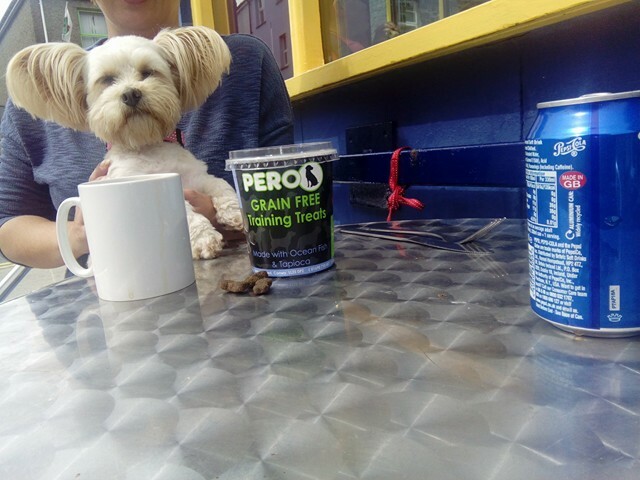 My human then showed them the Pero tub saying GRAIN FREE….well you should have seen the other humans face, much human chatter and a handful of biscuits where shared. Lets put it this way, there was one very greedy French Bull Dog called Nora who nearly scoffed the lot, then had the canine cheek to bark for more. As you know I live with 7…yes 1,2,3,4,5,6,7 cats. I think they’ve accepted me, well they push me out of the way and try to eat my Pero Dog biscuits even though they have their own Pero Cat biscuits. My favourite cat is Mr Tiger Feet, he sleeps outside in his ‘cat-pod’. He is much bigger than me and purrs a lot, I like sitting next to him on the sofa with the small human.